This is question #3 and #4 in an interview between deBanked’s Sean Murray and accountants Yoel Wagschal, CPA and Christina Joy Tharp. Q: ISOs and funders are often asked by their clients or their accountants how to record selling their future sales on their taxes. Should merchants just record it as a loan? A: No, No, No, and absolutely NO. “Loan” is a dangerous word. MCA’s do not handle loans because if these cash advances were loans then you could not charge such a high percentages. These percentages on “loans” would be against usury laws. Never, ever, use the word “loan”. Take it off of your websites. Take it off your business letters. Remove “loan” from your vocabulary entirely. The funder is buying and the merchant is selling “future sales”. Q: How should a funder record buying future sales from a GAAP perspective? From an IRS tax perspective? A:The IRS does not have any special provisions for the MCA industry so follow GAAP. If you have a departure from GAAP for tax purposes, it is the same as in any other industry. Very simple. Here you have a profit of 500 USD and this is what you see in your bank account. If the 500 USD is not in the bank it could be for various reasons which is why you need to reconcile. Of course, there is much more to the merchant cash advance business than these simple transactions but we want to stay focused on this for a little while. Now remember the business model of the supermarket? Every day the supermarket does thousands of orders and each order has dozens of items. We have to do the accounting for all of those transactions in order to reconcile the proper balances with the inventory. If done manually, we would need an entire staff of accounting clerks just to do those transaction entries. That’s why everyone in the retail industry understands that they need a good point of sale (POS) system in order to record the information. What do you think the accountant does? The accountant prints out a report at the end of the day/week/month and from that report the accountant creates one entry in the general ledger showing the summary of the day. I.E. : The summary tells the accountant that registers have rung up the total of 300,000 USD in sales of which 280,000 USD was paid in cash and 20,000 USD was paid on credit. The idea is that you can sell as many items as you want in a single period but that your accountant should not have more than one transaction to post to the general ledger. When you want to micro manage you look at the point of sale system. How do you know that the POS system is correct? What is the end goal? Where does the buck stop? Yes, the buck stops in your bank! If the POS summary is being put in the general ledger, and the general ledger is matching up with the money in your bank – BINGO! If it doesn’t match – TROUBLE! Unlike in a regular retail business (where you sell a product for money) the product that you are selling here actually is underlying money. It is not a loan, but a purchase of future sales. As this is the case, your bank account becomes the point of sale system. However, a bank typically doesn’t have point of sale capabilities when it comes to reporting and accounting. To successfully track every cent of your transactions a good cash advance company must have excellent management software. The software must provide a mirror image of the transactions in your bank accounts. The only way you can do that is if you have one bank account designated to handle only transactions that are reflected in the management software. If you decide to pay a phone bill from this “software transaction only” account, it will be just like a supermarket owner that takes a 100 bill from a cash register in order to pay the store’s phone bill. Once you establish the “software transactions only” account, (and you have an accountant who can record the summaries into the general ledger while understanding how the general ledger ties into the bank account) then and only then will you be in good shape. The understanding of the cash advance accounting journal entries can be very confusing if you don’t understand the small steps that make up the big picture. Research reveals sparse results. As that is the case, I will only illustrate a basic example (with no fees). Please keep in mind that each MCA has different ways of doing some things. This example will cover the basic standards but for modifications and special needs, you will need to find an accountant that understands the eccentricities of your own company’s business model. 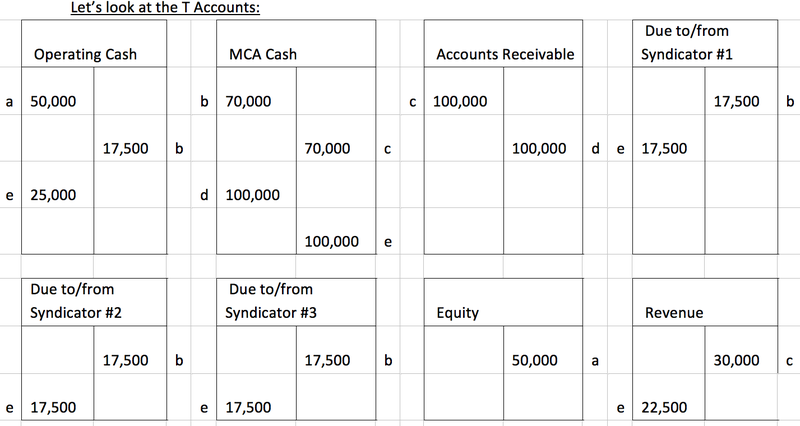 Our MCA model starts with the formation of a small fictional cash advance business. We will start this MCA business with 50,000 USD seed money and we make contact with three investors who we will refer to as syndicators. Yes, I know that some of you reading this call these investors or syndicators by different names, which is part of the confusion out there. To avoid further expatiation, we will use only the term “syndicator” in this article. On day one “ABC merchant” wants to sell 100,000 USD of their future sales to our MCA business for the discounted rate of 70,000 USD. We reach out to the aforementioned syndicators. They agree to contribute 25% each. We are going to have 30,000 USD in profit and it is going to be split among 4 people, each receiving 7,500 USD. Although the next step depends on when a MCA company repays its syndicator investments, we will assume the syndicators are all paid at once to allow for a simple transaction example. There is a credit to cash and debits to the syndicator accounts for the principal and the revenue account or an offset account for their share of the profit. The share that I have to split with syndicators wasn’t really my own revenue in the first place. After you examine all of the transactions, you’ll see that the chips fall in the right places. We started out with 50,000 USD and received profit from our 25% participated in a merchant funding deal. That deal ended with total revenue of 7,500 USD. It’s all there! If you truly understand these transactions and you have the proper system in place, then this process should be very easy to follow (even if each of these transactions happens a million times a day). However, if you don’t understand then you should be very careful because only proper accounting measures can save you from losing tens of thousands or even hundreds of thousands of dollars without ever knowing it. Unfortunately, I have seen it happen with my own eyes. Just like the grocery store example above, the sale of money to MCAs is just like the sale of tomatoes is to grocery stores. If left unaccounted for, those tomatoes could go missing without the store owner even noticing. Don’t let that be you with your money!